Hadassah International Supports the Hadassah Medical Center: More than a Hospital! On January 22nd, Hadassah Ein Kerem and the Israeli Air Force conducted a joint exercise to ensure the preparedness of the medical center’s helicopter landing pad. Air force helicopters and rescue teams must be able to land at Hadassah in times of emergencies. During the exercise, the ventilator located on the roof of the hospital was tested. This ventilator enables patients to be evacuated immediately from the helipad to Hadassah’s Judy and Sidney Swartz Center for Emergency Medicine and from there on to the operating rooms and intensive care units. 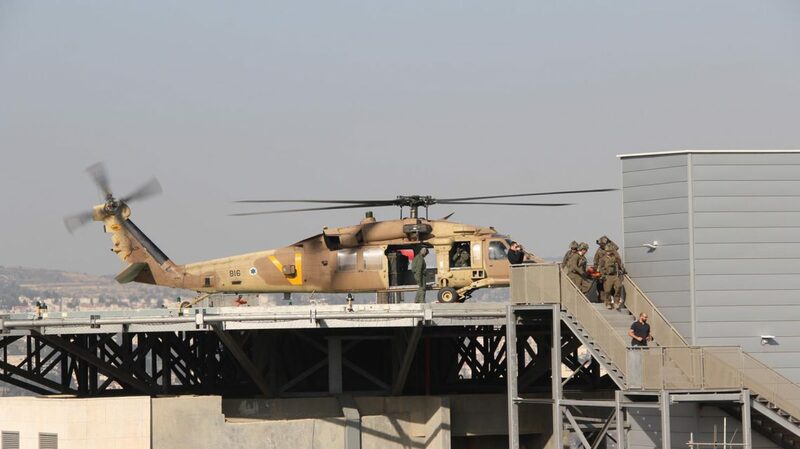 The helicopter landing pads at Hadassah were tested day and night to ensure rescue teams were able to function properly no matter the conditions.